Field Guide to the Bees of Great Britain and Ireland. Steven J. Falk (2015). Keys and describes all the British species known by 2015. A visual guide for the identification of British Coelioxys bees - Rhian Rowson & Mark Pavett (2008). BWARS members Rhian Rowson and Mark Pavett have produced this photo-guide to aid the identification of British Coelioxys bees. Test Key for Hylaeus bees - Alan Stubbs (2007). BWARS member Alan Stubbs has produced this test key. Please read the introduction before using this key. The British Potter and Mason Wasps - Michael Archer (1996). BWARS President, Michael Archer has kindly made the key from his Handbook available as a free download. Keys in Czech and English. Lavishly illustrated. Includes all British species. 3 Myrmica species - Phil Attewell (2011): Part 1 and Part 2 aids to help separate Myrmica scabrinodis, sabuleti and specioides. Stenamma worker ants - Mike Fox (2009). BWARS ant record coordinator, Mike Fox has produced this photographic guide to distinguishing UK Stenamma worker ants. 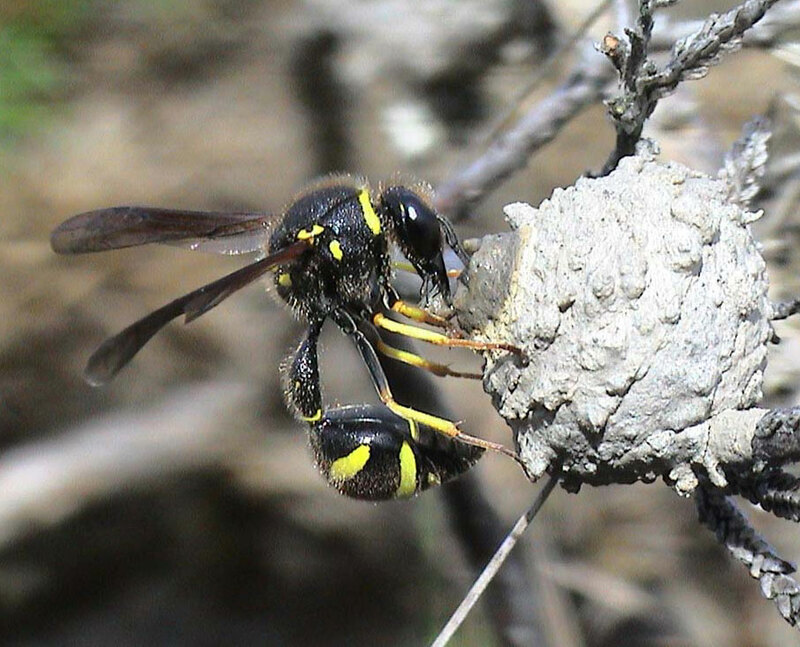 Eumenes coarctatus - a potter wasp.